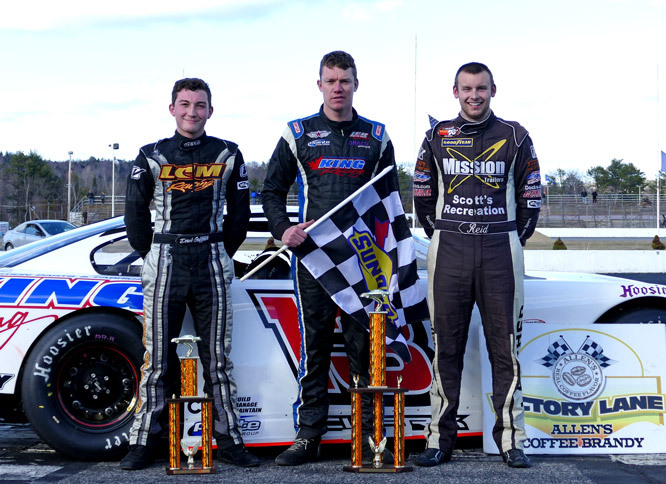 Oxford, Maine - Cassius Clark of Farmington scored an impressive 50-lap Super Late Model victory Saturday afternoon, kicking off the 2018 Budweiser Championship Series season at Oxford Plains Speedway. Clark, driving the King Racing 13 owned by Nova Scotia racing legend Rollie MacDonald, started fourth and had to get by reigning track champion Alan Tardiff of Lyman and multi-time Oxford 250 runner-up Reid Lanpher of Manchester to earn his trip to victory lane. Lanpher hung on and posted a second-place finish, just in front of current Pro All Stars Series National Championship leader Derek Griffith of Hudson, New Hampshire. Gabe Brown, a 15-year-old newcomer from Center Conway, New Hampshire, finished in fourth position, with defending titlist Tardiff fifth under the checkered flag. Tyler King of Livermore coasted to victory in the 30-lap main event for Allen's Coffee Flavored Brandy Street Stock competitors. King won his heat race before leading the full distance in the finale. Lisbon's Rick 'Flash' Spaulding was the best of the rest, with Norway's Mark Turner picking up the official third-place finish after a penalty was assessed to Jordan Russell. Turner's Matt Dufauklt and Rick Thompson of Naples rounded out the top five. 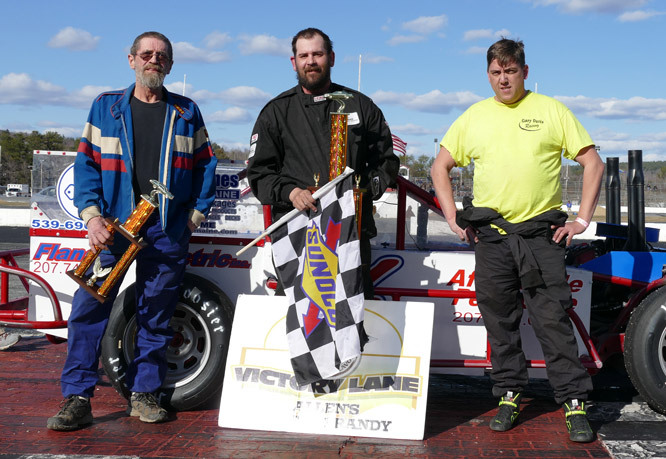 Shaun Hinkley of Oxford prevailed in a thrilling 20-lap feature race for the Bandits division, outgunning two other former champions in the four-cylinder class to claim opening day honors. Waterford's Jamie Heath earned runner-up honors, with the podium filled out by the division's reigning champion, Brandon Varney, now from Mechanic Falls. Rob Crepeau of Minot and Oxford's Chad Wills rounded out the top five. Kyle Kilgore of South Paris drove to victory aboard his wild-looking creation in the 20-lap Figure 8 race. Minot's Eric Hodgkins bounced back from an on-track altercation to claim runner-up honors. David Smith raced to a well-earned third-place finish, ahead of Greg Durgin of South Paris and Lisbon's Dale Lawrence. 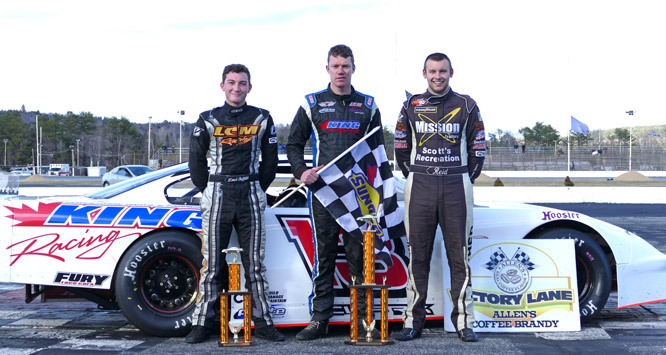 Stock car racing action at Oxford Plains Speedway continues Sunday, April 22 with the Pro All Stars Series Super Late Models topping an action-packed program beginning at 2:00 p.m. Oxford Plains Speedway is located at 877 Main Street (State Route 26) in Oxford, Maine. For more information visit oxfordplains.com or call (207) 539-8865. Budweiser Super Late Model (50 laps) 1 13 Cassius Clark, Farmington; 2 59 Reid Lanpher, Manchester; 3 12 Derek Griffith, Hudson, NH; 4 47 Gabe Brown, Center Conway, NH; 5 9 Alan Tardiff, Lyman; 6 01 Andy Saunders, Ellsworth; 7 88 Brandon Barker, Windham; 8 61 TJ Brackett, Buckfield; 9 03 Scott Moore, Anson; 10 8 Calvin Rose, Jr., Turner; 11 72 Ryan Kuhn, East Bridgewater, MA; 13 78 Ivan Kaffel, Raymond; 14 11 Steven Chicoine, Portland; 15 96 Justin Gibbons, Bridgton; 16 77 Bryce Mains, Bridgton; 17 28 Mark Lundblad, Jr., Conway, NH; 18 29 Austin Teras, Gray; 19 1 Dale Verrill, South Paris. 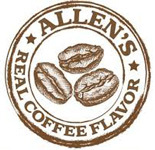 Allen's Coffee Flavored Brandy Street Stock (30 laps) 1 11 Tyler King, Livermore; 2 36 Rick Spaulding, Lisbon; 3 09 Mark Turner, Norway; 4 61 Matt Dufault, Turner; 5 74 Rick Thompson, Naples; 6 21 Zach Bowie, Turner; 7 4 Jordan Russell, Norway; 8 33 Andrew Breton, Greene; 9 56 Addie McDaniel, Bridgton; 10 52 Mike Nichols, Livermore Falls; 11 27 Patrick Thorne, Standish. Bandits (20 laps) 1 2 Shaun Hinkley, Oxford; 2 91 Jamie Heath, Waterford; 3 1 Brandon Varney, Mechanic Falls; 4 77 Rob Crepeau, Minot; 5 52 Chad Wills, Oxford; 6 6 18 Dustin Salley, Poland; 7 12 Adam Sanborn, West Paris; 8 24 Travis Verrill, South Paris; 9 3 Chachy Hall, Oxford; 10 44x David Cook, Livermore Falls; 11 11x Cam Childs, Leeds; 12 44 Tyler Libby, Auburn; 13 55 Dean Jordan, Jay; 14 41 Brad Johnson, Fairfield; 15 49 Jake Dobson, Hartford; 16 4 Jeff Libby, Auburn; 17 14x Cody Billings, Hartford; 18 14 Brandon Caston, Casco; 19 51 Kyle Hewins, Leeds; 20 08 Mike McKinney, Berlin, NH; 21 93 Justin Spear, Wiscasset. Figure 8 (20 laps) 1 4 Kyle Kilgore, South Paris; 2 97 Eric Hodgkins, Minot; 3 54 David Smith, South Paris; 4 41 Greg Durgin, South Paris; 5 2 Dale Lawrence, Lisbon; 6 00 Larry Lizotte, Poland; 7 07 Kyle Glover, Oxford; 8 154 Devon Smith, Oxford.